Truck/Automotive companies have increasingly high standards for housecleaning. Many automobile dealerships have discovered the labor savings available with our battery scrubber's cylindrical scrub deck feature. By sweeping and scrubbing in a single path, their operators can clean around service bays without clogged squeegee hoses or streaked floors. When in the industrial truck repair bays it is important the scrubbers be able to survive the harsh application. The fully accessible recovery tank and drain saver basket simplify daily clean-up of the scrubber. 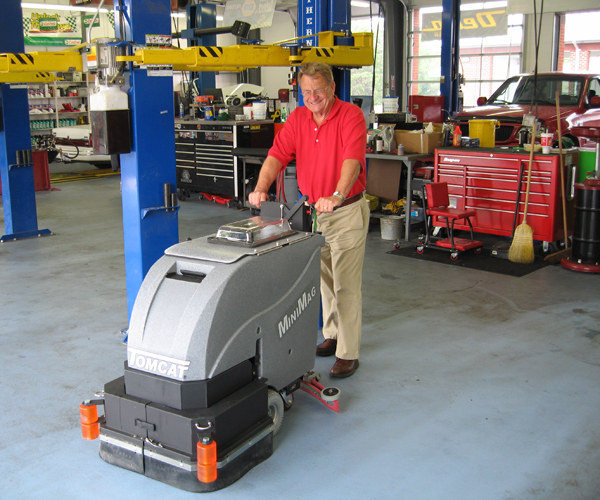 Our disk battery scrubbers are typically found in the car dealerships showrooms, where deluxe floors are increasingly common. Often called on to scrub up spills of hydraulic fluid, oils or coolant, the scrubbers need to be built to perform on a moments' notice.